This roof in Cambridge Road, St. Ives, Cambridgeshire had a traditional Welsh slate roof. We removed the existing slates and fitted a breatherable felt membrane and battens. We then fixed a new composite slate roof. These slates have a 60 year warranty, making these slates a good roofing option. The chimney had new lead work and we also installed new Deepflow guttering. 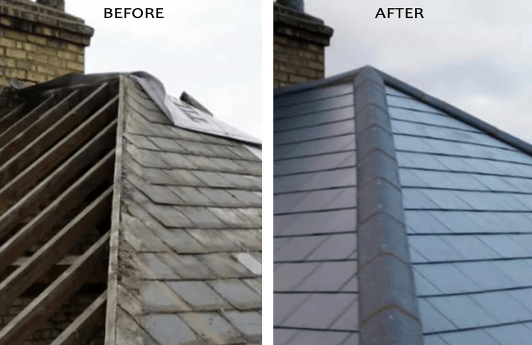 These before and after photos show the great finish delivered by our roofer.